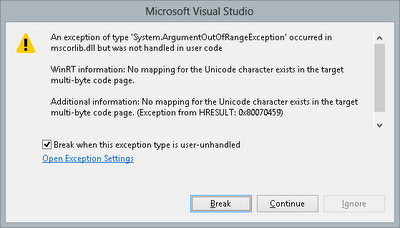 The following code to read the text contents of a file in WinRT thru an exception on some txt files and not on others. 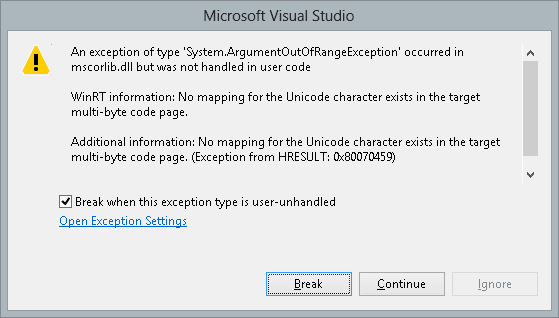 WinRT information: No mapping for the Unicode character exists in the target multi-byte code page. Changing the ’ to a ' resolved the issue. In another text file I also needed to change a – to -. 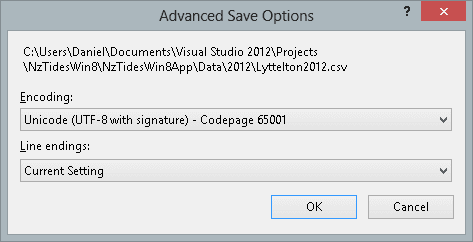 Change the file encoding using Visual Studio. When I opened the file it had the encoding: "Western European (Windows) - Codepage 1252"
Change the encoding to "Unicode (UTF-8 with signature) - Codepage 65001"
Thanks that really helped ! You are great man. Thank You!!! Hello Daniel, I prefer the second one but how to use western Europe 1252 codepage when I try to open fil with C# program writed with Visual studio 2015 (Framework .NET 4.6).